If your a homeowner chances are you have to deal with cockroaches all the time, more specifically German cockroaches. If your sick of dealing with German cockroaches than giving the best cockroach experts in Berkeley, CA a call is the right thing to do. Call us right now at (510) 900-8593. German cockroaches are not to be messed with at all, or any other type of cockroach. 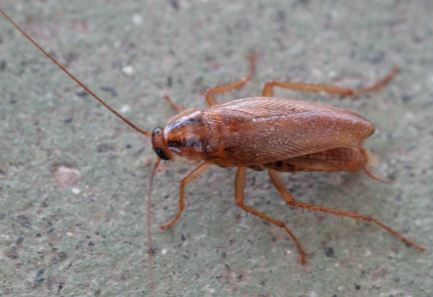 Unlike other cockroaches, these cockroaches love to remain indoors in warm areas. A huge German cockroach concentration remains near human structures due to the warmth and security provided. Other cockroaches love to fly, using their wings to go from place to place. By contrast, German cockroaches much rather remain on the ground and travel by feet. It is enough for a homeowner to see one cockroach to know a serious infestation problem is present. Of course, there are several other cockroach infestation indicators to look out for; which is why having the right professionals to save the day is vital. The reason why seeing one German cockroach is enough to declare an infestation is due to the reproductive cycle. Like other insects, German cockroaches reproduce at a high rate. Female German cockroaches will reproduce anywhere from three to six egg sacs during the total life span. Each new cockroach egg sack contains up to forty-five newborns. ​As you can see one German cockroach is enough to lead to hundreds and potentially more. When one cockroach is detected it is extremely important to have the professional consultation of any expert to get rid of the situation. These viscous cockroaches will make life challenging if your not careful enough. "Stopping the bleeding, before it gets too big" is a good mantra to live by. Looking around your house for any visible signs of a German cockroach issue may be smart. Signs include, but are not limited to droppings, odor, and egg capsules. Typically, German cockroaches will enter a property via a human. Humans bring in bags, boxes, garments, and other easy accessories allowing these cockroaches to easily make your property their next home. If you live in an apartment building a German cockroach may have the easiest way to hide via between walls, pipe structures, and crawl spaces. It may be challenging to find the German cockroach source, which again is why having the best cockroach technicians in Berkeley can fix the problem easily. A German cockroach infestation is never good, and should be avoided at all costs. Getting rid of German cockroaches is as easy as picking up the phone and contacting us, call us right now (510) 900-8593.